Museum curator Peggie Silverman Ehlke devoted her life to preserving the past but never stopped living life in the present to the fullest. "She didn't slow down," said Deborah Dunn, director of the Mission Houses Museum. "At an age when some people are winding down, she kept going. She lived her life fully." Ehlke died Oct. 18 at the age of 81. After Ehlke, a fifth-generation descendant of missionaries, served as curator for the Mission Houses Museum, working there for 25 years. She continued to volunteer until this past summer. Ehlke was "the first professional curator the museum had," Dunn said, upgrading storage for quilts and other textile exhibits to 24-hour climate control. 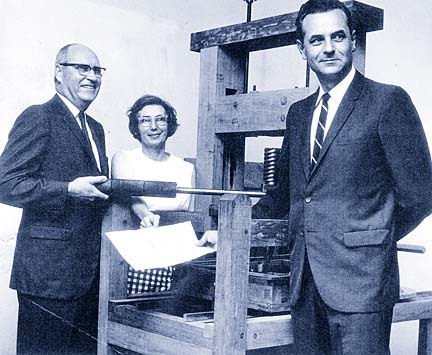 In the 1960s, Ehlke wanted to reproduce a Ramage press, like the one that American missionaries in Hawaii used to produce the first Hawaiian language book, but the press had disappeared from the islands. "It just shows her imagination, her zeal and her creative abilities," said friend Yvonne Singer. Ehlke felt printing in the Hawaiian language was one of the most important things the missionaries did, Singer said. Ehlke's search for the press with friend Albertine Loomis, a great-granddaughter of the first mission printer, took them to the mainland. The quest yielded plans for a Ramage press. From the plans, students at the Honolulu Community College built a replica, which became the centerpiece of the Kahale Pai exhibit at the Mission Houses Museum, a reproduction of the Honolulu printing office of the Sandwich Island Mission Press. Dunn, who met Ehlke when she was first beginning her career, said Ehlke impressed her as someone who never stopped learning. While in her 60s, Ehlke wrote her master's thesis on a prominent missionary family. Ehlke had a passion for quilts, Singer said. She also traveled to the neighbor islands working on the Hawaiian Quilt Research Project, which catalogued Hawaiian quilts. Ehlke was a descendant of Rev. Ephraim Weston Clark, the third pastor at Kawaiahao Church, who translated many books into Hawaiian.